Green Creation obtained the certification with level 3 of Sustainable Turism Certifications (CST). The Costarican Institute of Turism (ICT) granted this certification. The CST has been recognized by the World Tourism Organization as one of the most important programs that promote the improvement of the responsable and sustainable tourism. 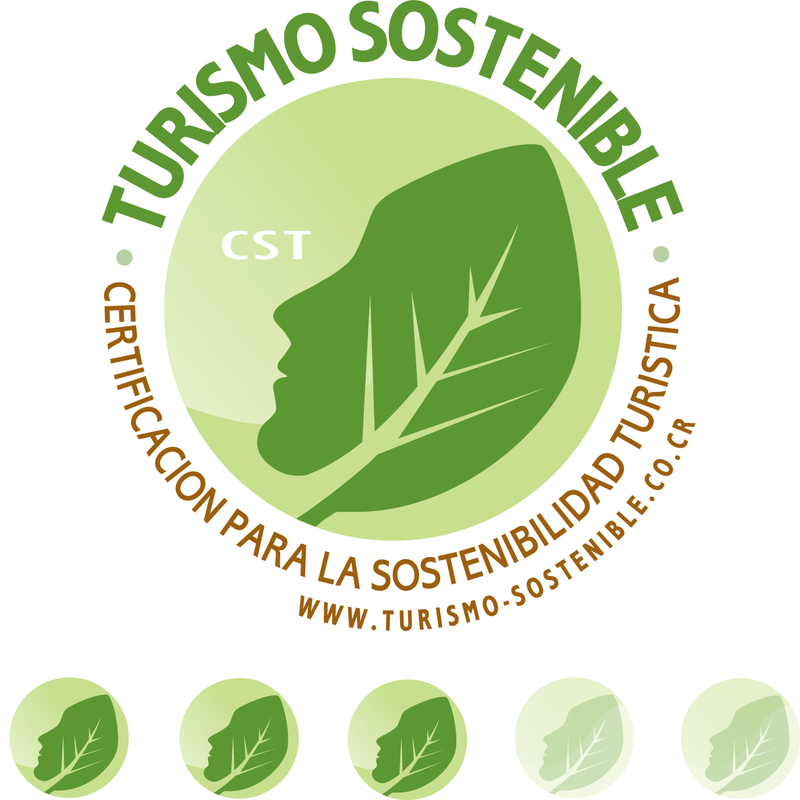 The CST was created to differentiate tourism companies that do sustainable: Natural, cultural and social factors. Motive to the staff to maintain recycling practices in the office and in their homes: divide the waste into paper, aluminum, tetrapack, plastic, glass and biodegradable material. Water Care: place signs in bathrooms and sinks that motivate to save it. Put a bottle of half-liter water in the bathroom ponds, thus saving half a liter each time they pull the chain. Energy care: use only the necessary bulbs and as far as possible are energy saving. The staff must report any type of illegal extraction and captivity of wild animals and plants. Inform to all involved, especially the customers who should not feed the wild animals. Provide sources of pollution in the tourist destinations with which the company works. Use transportation in optimum conditions and comply with emission regulations. Use biodegradable and reusable products for both personal consumption and cleaning of the office. To promote occupational health in the office, provide job security for employees, have emergency plans, and first aid care, to avoid accidents and reduce the risk of diseases. To have the appropriate conditions so that the employee can perform his functions in an adequate and safe environment. Work with suppliers who have all the necessary measures to guarantee the security of the clients during the accomplishment of tourist activities. Offer suitable destinations for clients with disabilities in compliance with Law 7600 of Equal Opportunities for Persons with Disabilities in Costa Rica. Participate in recycling and cleaning programs both in the community and in the different destinations of the country. Participate in rural programs that highlight our culture. Encouraging sporting, artistic and cultural activities. Use certified guides and drivers properly trained. To motivate our clients to carry out sustainable practices when they are in the country and when they return to their homes: that they do not take objects or animals from the forest, that they do not leave garbage, that they save water and energy in the hotels, that do not provide them Food of any kind to the monkeys or other wild animals, if they observe the spawning of the sea turtles, they must always be accompanied by a qualified guide and with dark clothes. Motivate our clients to support conservation programs. Recommend hotels with sustainable practices and where possible with the CST. Recommend tour operators with sustainable practices and where possible have the CST. Our agency is against any type of exploitation, mainly of sexual form in our children, so we commit ourselves to report any suspicious activity. We encourage all our employees to send emails to our customers and suppliers have a message to reduce the printing of paper needs: "All together in the fight against environmental pollution. Before printing this email take into account if it is really necessary ". Check the vehicles at least 02 times a year to verify compliance with the emission regulations. When planning your trip, choose those suppliers who offer guarantees of quality and respect for human rights and the environment. Use natural resources, such as water and energy, in moderation. Remember that they are limited goods. Try to minimize the generation of waste. They are a source of contamination. When you have to dispose of a waste, do it as cleanly as possible and always consider recycling. In a natural space make sure that the only footprint left behind is that of your footwear. If you visit sensitive ecosystems such as coral reefs or forests, find out how to do so to minimize impact and not degrade them. When buying gifts and souvenirs look for products that are an expression of the local culture. It will favor the economy of the peoples that welcome it and the cultural diversity. Do not purchase flora and fauna protected by the Convention on International Trade in Endangered Species of Wild Fauna and Flora or products derived from such species. It is a crime and contributes to its extinction. In your destination enjoy knowing the culture, customs, gastronomy and traditions of local populations. Respect them and come close to them, they have much to tell you. Try to contribute with your presence to the development of responsible and sustainable tourism, building with your trip a healthier and more solid planet.It is forbidden to carry food and feed the species present in these areas, in order to have a negative impact with the natural process of our species.